Journey to a land lost to time and legend. They mythical land of Astenthal where once the four raes lived in a golden age of peace and mystical knowledge long passd. Where the very ideals of tolerance, equality and justice were a shining beacon of harmoby Yet the brightest ligt casts the deepest shadows and Astenthal fell, ruined to mist shrouded memory, a dream of a better woreld swallowed in a cataclysm of hatred, war and avarice. Legend speaks of the return of lost Astenthal's kig. a good a righteous man who would reunite the virtues and peoples of the land bringing the dawn of a new age. Dare you journey into the lost past where the darkest shadows grow and take a hand in shaping the destiny of a people who have abandoned the future long with the outside world? Will you confront the growing darkness that threatens to engulf Astenthal a second tie? In a Land of tainted with ancient loss and pain, can you reunite the people before darkness engulfs them. In a world of shadows can you rekindle hope? First in the Legendary Lands series, Cloudholme is designed to be inserted into an existing campaign world or form the basis of a new campaign. DMs will be able to use the rich and diverse cultures inside this book to enrich their campaigns, while the geographic locations provided are easily inserted into any existing world. Also included is a large adventure that will carry your players into the realms of legends and lost cities, testing thier resolve and resilience. 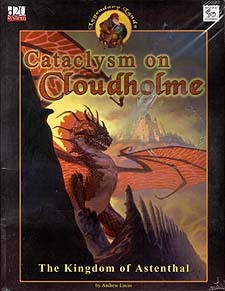 Cataclysm on Cloudholme is a d20 System sourcebook and advenuture designed for 4-5 characters of 5-7th Level.